Long before Jamestown, Spaniards, free and enslaved Africans and Native Americans crafted our country’s first enduring European settlement — St. Augustine, in 1565. Discover the first colony through archaeology, history and the stories of people who lived there in this hands-on, interactive exhibition. These first colonial immigrants created America’s original “melting pot” — a colorful, multicultural society that was new then, but might seem familiar today. Discover why Spanish settlers traveled by ship to Florida. Displays profile the mission of the Spanish and explain why they risked the demanding journey. Visitors can test their strength with a cannon ball lift and examine colonial gold and silver. Take a closer look at the daily lives of the Spanish settlers and see actual artifacts from the first colony. Learn about interactions with the native Timucua people. View what the colony looked like as imaged through 3-D gaming software that allows visitors to fly through the first settlement and hear stories of its residents. Discover how archaeologists have revealed the first colony’s story with an in-depth discussion of the process, complete with numerous artifacts and an interactive multimedia centerpiece that allows visitors to be the archaeologists. Put your “street smarts” to the test! Learn about town planning and build your own town based on settlement regulations in an interactive game. Stroll through a Spanish colonial streetscape and explore households and daily activities, from religious practices to work lives to leisure. See how the military defined the settlement and how life on its frontiers evolved. Find out why we don’t speak Spanish today! Globalize your world view with an interactive map to mark family origins and a multimedia interactive that allows you to create and share your own cultural collage. Observe the daily life of a modern American woman mirrored with a woman from the first colony — their lives may be more similar than you think. 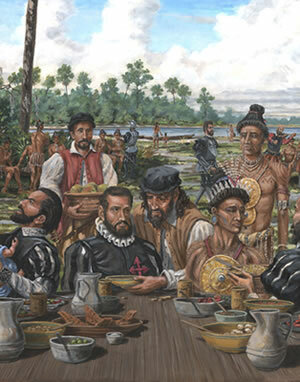 The first Thanksgiving was held in the first colony in St. Augustine, Florida, on Sept. 8, 1565, decades before the pilgrims landed at Plymouth Rock. The first Spanish ship carried 26 women to Florida. Government-sanctioned Catholicism was the only religion permitted for Spanish colonists, and the church influenced nearly all aspects of life. St. Augustine’s residents developed a way of life that blended Spanish, Native American, African and newly-created practices. Both free and enslaved people of African heritage lived and worked in St. Augustine, but Spanish slavery differed in many ways from English slavery. Spaniards established the first legally sanctioned free black town in North America, Fort Mose, in 1738. First Colony: Our Spanish Origins was produced by the Florida Museum of Natural History and UF Historic St. Augustine, Inc., and sponsored in part by the Department of State, Division of Historical Resources and the State of Florida.